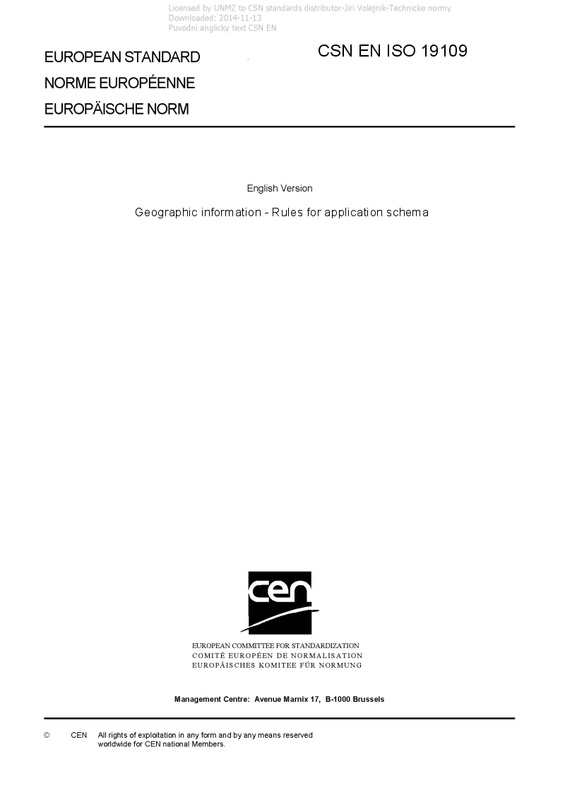 EN ISO 19109 Geographic information - Rules for application schema - ISO 19109:2015 defines rules for creating and documenting application schemas, including principles for the definition of features. The scope of this International Standard includes the following: - conceptual modelling of features and their properties from a universe of discourse; - definition of application schemas; - use of the conceptual schema language for application schemas; - transition from the concepts in the conceptual model to the data types in the application schema; - integration of standardized schemas from other ISO geographic information standards with the application schema. The following are outside the scope: - choice of one particular conceptual schema language for application schemas; - definition of any particular application schema; - representation of feature types and their properties in a feature catalogue; - representation of metadata; - rules for mapping one application schema to another; - implementation of the application schema in a computer environment; - computer system and application software design; - programming.